We proudly recommend American Standard bathroom fixtures! Create your dream bathroom with American Standard’s extensive portfolio of bathroom collections and complete bathroom suites filled with beautiful sets of coordinated products to mix and match. Stark, clean lines and minimalist details define the Modern design style. American Standard’s collections of modern bathroom faucets, toilets, sinks, and accessories offer elevated design, with the utmost in quality and innovation. Classic, timeless and elevated – traditional bathrooms feature beautiful designs that withstand the test of time. The American Standard traditional collections of toilets, bathtubs, faucets, shower faucets, and sinks create a sophisticated space with time-honored design and unbeatable style. For comfortable, sophisticated bathrooms that call back to classic lines, with updated contemporary touches – these transitional faucets, toilets, sinks, bathtubs, and shower faucets will bring an elegant, up-to-date feeling to your bathroom. American Standard strives to create innovative bathroom products that work for you in ways you would never expect. My husband and I decided to use your companies remodeling services when we watched Joe and Danette F.’s home being built in 2004. We met Scott Miller your salesman, and relayed to him what we thought we might want our addition to look like. Scott was very thorough and confident with his design, and incorporated the ideas that we wanted with ease. We decided to have our remodel start in November 2004, and Scott was very accommodating, showing us step by step what we were to expect of your company in a reasonable time frame, about 3 months. A schedule of payments was submitted by us through all phases of the work. The crew was very respectful of our home and us. Tom and Isa, spent several days here and we noticed that all of your employees were able to do any of the tasks up to code. Greg Miller, the lead framer helped us plan out little extra details that we had not thought of. David Westover did the stucco, drywall and painting and everything matches the existing home and looks very professional. Greg Larrision did the final trim, and Deb Taylor did the final cleanup inside our home as well as the outside. Your crew was here every day at the same time, and left our home in a clean and neat fashion before they left for the day. Our home was completed 2 weeks ahead of schedule. We don’t want to forget Jeremy, we don’t want to forget his time and effort in this project. He seems to be getting trained for his position quite well. 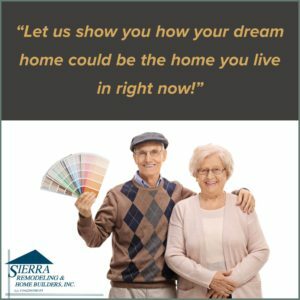 We are very pleased with the work that was done and we will highly recommend your company to anyone looking for a new home to be built or a remodeling job.